Coming back to the topic... Today I decided to spend my time off 1 hour when the kids are at class in this park. Every evening I choose different ways to pass the time. Not going to delve into that right now. Today for some reason the park invited me... I had actually planned for a nice chi-chatting-walkathon with a newly found friend, but it so happened that she was occupied otherwise... So I ended up with myself, walking and chitchatting with my non stop thoughts..
Today for since reason the park looks more lovely and beautiful than it ever did. Is it because I am actually 'SEEING' it today?.. Most days I am so engrossed in the music or the walking speed.. But today I looked around and took in the sights, not the sounds.. For I had the most musical pieces of MS playing in my ear. This area is filled with stone really elegantlly looking people, mostly aged and middle aged.. Except for the play area which is filed with the cutest of tiny tots. This is indeed a very well maintained park... Beautiful adorned with very very lush and thick and colourful bougainvillea on the sides of the park.. Green plants all around and inside the park. One small area cornered off and filled with pebbles for 'accupressure' walk experience.. One small area with exercise equipment for adults. Along the walk itself many neat small benches.. Here I saw a gang of uncles chatting and laughing off - enjoying the best times of their lives - an aunty meditating, a married couple rejuvenating their relationship, a passionate lover couple trying to restrain their passion, could of parked wheelchairs with few unfortunates who can satisfy their basic need to walk only by observing others... Few prams and their proud parents walking or playing with the giggling babies inside.. Though all our trips are planned almost a year in advance, there are occasions where we surprise ourselves by planning a weekend trip just two or three weekends in advance. Ahem! I think the day we plan a trip in the morning and start in the afternoon will probably never come - i think that is being too impulsive - for my character. So, that was how the trek to Kudremukh was planned for the weekend of Pongal, only after the year began. One moment R said shall we go, second moment a call went to our friends S&L and 3rd moment the search for homestays and 4th moment the homestay confirmed. The toughest part was to convince the little ones to bunk school on Monday. I think by now they have gotten to use just how irresponsible parents we are when it comes to have 100% attendance in school - that they did not kick much fuss. All was good. Early morning, packed to the hilt we started off in our little red wagon, enjoying the awesome weather and drive to Kudremukh. On the way we stopped for breakfast at a new place called "Dhruvathare" suggested by S and it indeed turned out to be a lovely place with good food and nice restrooms and a small play area in the front for the kids. It was also packed to the hilt and we actually had to wait to get a place to sit. A little after this stop, we encountered and awesome sight. The area was so fogged that we could hardly see 50 meters in front of the car. We drove this way for nearly 2 kms and it was great fun. Most of the journey was on the Chikmagalur Road. At Kottigehara, we took a turn towards Kudremukh to enter the ghat section. This section of the road , until we reached Kalasa is one of the most beautiful ghat sections that I have driven on. We could not enjoy the onward journey as much as enjoyed the return because of Little Mili's motion sickness and throwing up issues. We managed to stop at a beautiful road side tea plantation and too some really cute pictures. On this route is a very charming little Coffee shop - which sells one of the most amazing coffee powder I have ever had. Their house - which is a vision of green - is adjacent to the shop and is a wonderful place to view. And the best part I found recently is that he can ship the powder to Bangalore also. Soon we reached Balagal. Here we parked our cars and got into the Jeeps that our "Resort" provided to reach their place. I have been to my fair share of these homestays that are situated high up in the hills or low down in the valley (Jhari Eco Valley) , that the only means of transportation is their own Pazhai kalam jeeps (the types that Rajesh khanna would go about singing - Mere Sapnon ki rani .. or Chala jaata hoon ... except that the driver would be nowhere comparable to Rajesh Khanna). But this is my far the most bumpiest and most toughest ride I have ever experienced. The ride is about 2 - 3 - 4 Kms ? sorry i forget the number; but it feels like eternity - before we reach the slope that deposits us in the feet of the homestay. My feelings about the homestay started with something and changed into something else over the course of our stay here. Mind you, like I do as usual, this time I had done no research about this place that the Mr. had booked. So let me start from the beginning. A flight of rocky steps lead upto a big large courtyard , where there were coffee beans scattered in a neat long patch to dry. We found a few tents set up around the courtyard. We reached there at about 3 in the afternoon and the place was totally deserted. There was a huge house with a large verandah and a couple of rooms set away from the house adjoining the verandah. On the first floor we could see large rooms akin to a dormitory. The entire place was surrounded by greenery and mountains as far as the eye could see. It seemed more like a house than a homestay - if you get what i mean. After calling for a few mins, a tiny lady came out and we managed to convey to her that we have come to stay for two days and would like some lunch. Unfortunately for the "communication" skills of the Mr. , apparently it seemed that they did not expect us for lunch and we were STARVING!!! ... She said she will arrange something and went in. When you are keenly waiting for something , time just seems frozen and it was the same for us and no matter how much we tried, we could not make any small talk. Then she arrived with few buckets, followed by another man helping her with some more buckets. It was a very simple meal - rice , sambar , palya, buttermilk and papad. But boy! was it the most tastiest meal that we had ever eaten. Almost all of the adults took more than 3 servings !!! The Mr. who would not touch rice with a 10 feet pole ate 4 whole servings !!!! The place is a very very simple and rustic place. The two rooms that we were given were quite dingy and the bed very simple and small. They dont have a great mattress or pillows. Since the beds couldnt accomodate us 4, when we asked he directed us to use the thermocol sheets that would serve as mattress. For the average tourist who has never trekked or stayed in "trekky" places, this would be a big put off. But there is a reason why the place is so rudimentary. As Mr.Rajegowda explained - this place is only used by trekkers and predominantly in the moonsoon season where the entire place is crawling with leeches - it made no sense in investing in good mattress etc - which would never clear well nor dry well in incessant raining periods. When he put it that way it made sense. There was a very 'Alice hole' kind of bathroom attached to the rooms where there is no hot water. But there are two common bathrooms outside the main house where the hot water is just too amazing - fed from wood fires. Especially after a long sweaty tiring trek. Though it is a shame that the trekkers just dont bother to dispose off their soaps packets / shampoo bottles. The food is very simple - mostly consisting of Rice, a sambhar and rasam , palya , papadam and very watery curd. If you request they make the most awesome egg burji and a non veg dish - i cannot vouch for the taste of this one. Coffee and tea that is served in the morning and evenings is very sugary. It was the first time that the kids were eager to drink the beverage - no doubt!!! Rajegowda, his wife and the few helpers they have around are very helpful folks - of course you must know Kannada to converse with them. Rajegowda can manage a bit of Hindi. We found them to be very obliging to any reasonable requests we had. In the evenings it became very very cold and by around 6 we would start to shiver. We would wait impatiently for the next half hour to pass and darkness to fall , for then would light up the bonfire. There are very few chairs around in that place, so we would first pounce and get all the chairs and occupy them and spend the next 2 hours or more roasting in front of the first, impatiently waiting for hot dinner to be served. Dinner was mostly the same fare as lunch with rotis and one subzi added extra. Once again - very simple yet very tasty food. Now the Trek - It is probably one of the most beautiful treks I have ever been on. Mainly for the fact that no matter which part of the trek you are in, you will be able to see your destination looming clearly ahead of you. It is also a very beautifully maintained trail - thanks to the 'No Plastic' rule and the fact that there is a guide that is appointment by the government to accompany you. The mountain is called so because it is shaped like the profile of the back of a horse - with trees dotting the mountain to look like the horse's mane and tail. It is a moderate to strenuous trek with many climbs and descents - both of them being quite steep. It is better to start for the trek very early in the morning - we started at 7:45, as the amount of cover along the way is limited and very sparse. Despite reaching the top at 11:15 and starting back nearly at 12 and having hats - we adults all got sun burnt on our head or shoulders. The first time I even got sun burnt - so did not even know it was sun burn that was causing my shoulders to burn. Almost after halfway the walk up, there are few streams that you can refill your bottles from. There is enough flat space on the top to sit and enjoy quiet moments. We came back from the trek, tired and famished - to enjoy some nice onion pakoda and sugary coffee. Refreshed after a very hot bath - we settled in front of the fire again and enjoyed our last night at the homestay. I am almost tempted to want to do the trek again in monsoon, but just cannot stand the leeches. Let us see if there is a change in mind. Small Pleasure of Life ..
... watching the sun rise while you cycle ..
... Soaking in the sight of this beautiful Tabibuea Rosea, which last for just mere weeks in the streets of Bangalore. Last weekend we had been to our college friend L's new place and I was stumped by how lovely she had kept her house. It was no surprise for she had always been a stickler for neatness. After coming back, I carried a bit of the "clean bug" with me, I suppose, and looked at disgust with the dust laden shelves under the TV which contained an un-used DVD Player and a grandfather VCR ( I am not even sure anybody remember those anymore) and decided to declutter. My first recollection of video tapes were I think when I was in class 6 or 7. We had this shop near home where we could rent the VHS and the tapes for a period. My parents would rent the VHS and some movie tapes for the weekend and soon we decided to buy our own one - as buying one turned to be more economical than the renting. My dad researched a bit and we bought a VCR and our first VHS tape on which we could record movies from the TV. 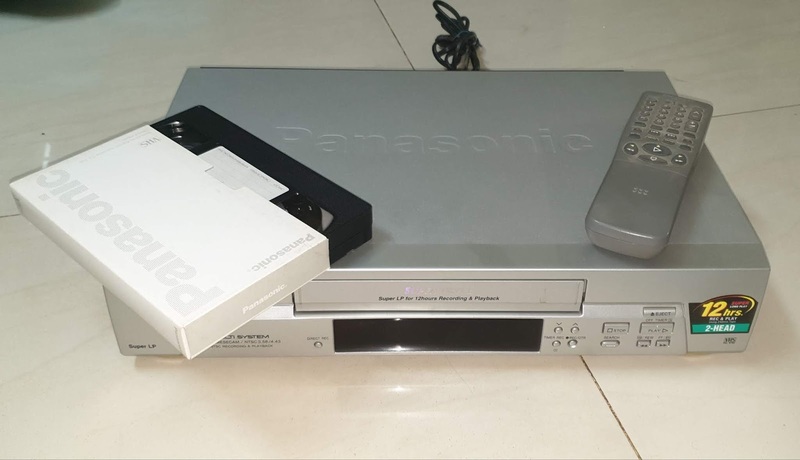 I still remember the enthusiasm I felt when we got it all hooked up and set up the VCR for recording and recorded our programs. There started the awesome journey of recordings ... We soon learnt the magic of timed-recording, which helped us record movies and programs when we were out of home. Late Night New Year programs, missed episodes of Chitrahaar (remember how excited we were to be shown the 1/10th of a new song that would be released another month later), sunday morning cartoon shoes on DD... all of these would get recorded. Funny, we were never a "serial" loving family else we would by now have had zillion tapes containing all the episodes. Then came the phase when I bought my first video recorder in 2003 and recorded the entire of New York for my parents. They were so enamoured by it that my dad had got it transferred to 2 or 3 VHS tapes so that they could play it again and again in bits and pieces. Amma and me are great fans of 'Heidi' - so when I went to the USA for the first time, I bought her the original movie where Heidi is played by the famous child actor Shirley Temple. One well loved 'dog-eared' VHS tape I found was of Tom and Jerry cartoons - I did have a super collection of those well loved shows which was a great source of entertainment in days when we did not have YouTube and could play almost any episode whenever we wanted. It has been a long week .. Started off with the R leaving for globe trotting to UK on Sunday morning .. Before I could rub my hands in glee and plan my so-called 'free' evenings - the little one goes and wakes up with a high temperature on Monday morning. I think that it must be that should-have-never-eaten-in-the-first-place 'ice gola' that she gobbled the previous evening while I was busy looking at trinkets in the mela in our apartment and leave for work ... I come back to find that she is still the same and has not risen out of the bed .. Worry starts to kick in and I somehow prevent it from turning into the panic monster. Tuesday morning sees me rushing first thing to Cloud nine because guess what - I felt as if was sleeping beside a hot pot the whole night .. The doc has one look at her and suspects to be H1N1 (excuse me those are meaningless letters put together for me ... I mean hello ... do normal people even get such an infection ???) Apprently yes ... later I come to know (thanks to whatsapp forwards) that it is very much in air and totally in Bangalore's air. Even before the suspicion is confirmed as a test she puts her on medication (I love you Doc for that) ... and after confirmation - the entire family gets on medication. It is no easy job taking care of a sick child - I dont need to tell you moms - it is worse when you also get the same sickness (if not fully partial) and you have a fully healthy child to take care of also and prevent her from falling sick. While walking back to catch an auto to rush back to the little kittens that were wailing for their mamma at home , I remembered this song .. https://www.youtube.com/watch?v=At1qTKjiz-I ... and realized that this is really what the world needs ... a little love ... that is what my mother needed .. a little love .. the medicines, doctors , care and all is there ... but that little love helped her .. I read an interesting article in The Young World (in fact go to touching the newspaper after a long time) yesterday - which set me thinking. We live in times of excess - excess of everything - that we probably dont realize the sweetness of missing something or the value of anything at all! I was cleaning up my kids cupboard and found about 7 boxes of crayons - each one of them opened and probably used just once or twice ; 15 pens of different shapes , sizes and types; 34 pencils ; 42 erasers of all different shapes, colors and fragrances ; 16 sharpeners (why would ever need more than 1 sharpener at a given point beats me!) - and all of these are not even bought by me !!! They all are part of the elaborate 'Return gifts' that I have collected over the years for birthday parties that the girls have been invited for! Of course they dont realize the importance of a single thing! They dont feel the same attachment as I felt for the one and only one "pen-pencil' that I had all the years that I was a student at school and the sentiment that was associated with it as I had worked hard to 'earn' it as a prize for getting good marks in a particular exam! Or the fact that I still keep the fountain pen that leaks ink every time you use it - but saw me through all of my college years - despite the leak - because it was the gift from my late grandfather! The same goes for clothes. There is no longer the need to wait for an occasion to buy clothes now-a-days. The need for clothes is more driven by sale seasons or demands of various classes they attend to or worst of all birthday parties they attend to! I still remember how attached I was to the skirt I got for my 8th birthday - one that could stretch from one end of the room to the other - it was much more expensive than my parents' budget and so I valued it more than anything in my wardrobe - for I knew that the next time I got something really good would be about a year later - at the minimum! Ah! I miss the good old days! Bhagwan - Hai kahan re Tu? The first time I heard this song from PK - I really did not give it much thought. But when I heard it on the big screen again - while watching the visuals, the song just stuck to be like glue. Today, when this song plays I cannot do anything else, but just sit back, close my eyes and focus only on the lyrics and the pain of the truth in Sonu's voice. Maya had her 4th month shots yesterday and I noted something strange. The night she had her 2nd month shots we watched 'Dasavatharam' - thanks to the Mr. who held Maya all the time. And Yesterday night we watching a little part of "Kuselan" - thanks to Maya - who slept a bit early (maybe it was the shots). One starring the "universal hero" and the other starring his rival "superstar" - What a coincidence huh? The Mr. and I are not a great fan of movies - in the sense that we need to watch every movie that gets released - but are a fan of GOOD movies - old or new and make a point to watch the special and good ones. Once in a while this post comes back ... because there is no specific topic to write about but a mix of many small small things. Why do the best of thoughts and ideas come at a time when I cannot pen (sorry key) them down. I almost wrote the entire blog in my mind while cycling back today and now cant recall a single word of it ! Arghhh! Yesterday was one of those days that came after a long long time in my life - when I just did not feel like doing a single single thing - could have sat a wrote this then - but just could not life my pen (oops sorry press a key down). Life has been whizzing past with various milestones happening, some being jotted down hurriedly in the book of memories, some just lost in dusted pages of my own brain. My dad has always hated me listening to bollywood songs , but I have always felt that my life has been connected with just those songs in one way or the other - or maybe I made the connection myself. Can't say - the mind is such a curious toy. Mind - for the past one year or so - this has been the most prominent topic in my life. From talks with my friend R to my boss M and my own hubby - this one crops up every time - Mind - do we control it or does it control us ? What is this thing called Mind? I started to read the book suggested by M (and left it halfway - what is it with me and self improvement/ self help books - i just cant seem to be finishing them) - Untethered Soul - a very good read , when I got into the mood, it talks entirely about how the Mind as an entirely different 'being' which is totally seperate from us and how it causes us to do the things that we do and dont want do and think and dont want to think. The book hubby has been behind me to read also talks of the same - What to tell yourself when you talk to yourself. The same concept was spoken by Loiuse Hay - who i got in 'touch' with 4 years ago through - You can heal yourself. But why am I not able to grasp it ? Why am I not able to master it ? The concept is just so simple. I can control what I think ! I can make my life just the way I want it - all it takes is a very very small and simple change - the way I think. Why is it so hard ? No answer ! Is it just my stubborness to getting a better life and getting out of the self pity pool that I am so comfortable in wallowing in like a hippo? Today was a milestone. I cycled all by myself to Malleswaram and back. It felt ... sort of liberating .. It was just me , my music , my thoughts , my reflections of what I saw on the road ... Ever since I became an adult, I always wanted my soul mate .. Amma always berated me for wanting that one individual who would be my other half and how I would share every single thought in my head with that person. Maybe I was wrong after all - one does not really need that one person to be 'happy'. I dont know ... Does one need ? Too many confused thoughts! Sometimes I wonder if all of these memories are special only for me, or do those people who I associate these with also think of me at times. Why should I care ? I write the story of my life only right ? Dont' I ? Like Krishna says in Gita - I should just keep doing my Karma..
Just another Human Being in this world trying to understand herself and the world, sometimes succeeding sometimes failing.